The Legion of Super-Heroes appear in Lego DC Comics Super Heroes: Justice League – Cosmic Clash. 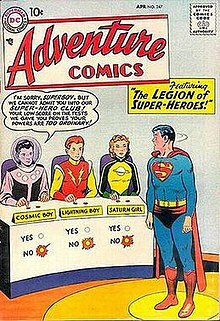 When Brainiac was changing history and turned Superman into an obedient cyborg, he wiped out the Legion of Super-Heroes leaving Cosmic Boy, Lightning Lad, and Saturn Girl as the only survivors where they managed to form a resistance against Brainiac. 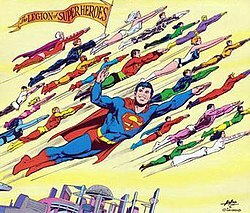 The Legion of Super Heroes attempt to hold off Superman, but they are killed. Though this was part of Saturn Girl's illusion. This page was last edited on 21 April 2019, at 23:02 (UTC).